One thing I love about mid January is the arrival of all of the seed catalogs. Even though winter is in full swing, and spring planting is still a way off, January and February are great months to plan out my garden. I love pouring through all of the pages, deciding what new flower varieties I might try, and what veggies I will plant. I love to look at all of the different varieties of plants. So many tomatoes to choose from, I want to try a few heirloom varieties this year, and the Big Pink Tomatoes look like they would be so pretty in the garden. I try to choose new colors of Zinnias every year, Zinnias are one of my favorite flowers to grow, I love the Queen Red Lime colored Zinnia, that will definitely be on my list. I also pull out last years garden plan and use it to make a new plan for each year, so I can make sure to rotate my garden beds from year to year to prevent disease and insect problems, and to decide where I want to put different flowers and any other changes I want to make. I like to get a jump start on making my gardening seed list so I can fit it into my budget. So even though it is snowing and finally wintery around here. The blossoming Heather reminds me that spring is just around the corner. Every year I like to plan a few new projects to improve or expand the garden, this year we are putting in some new raised beds to add to the veggie garden, as well as updating the flower and shrub beds. My poor flower and shrub beds have taken quite a beating this year from puppy. I will be adding low fences to some of these beds while I get them repaired and hopefully teach Zoey puppy to behave herself in the garden. She has the most peculiar habit of relieving herself on top of my lavender, yep, she climbs into my lavender bed, climbs upon a lavender plant and does her business. It makes for interesting work cleaning up the yard- apparently she likes her rest room smelling of lavender. Funny, interesting, but annoying, because my lavender bed is the central focal point of my back garden, a little pruning, a couple new plants to fill in damaged area, and a little fence and time ought to bring my lavender bed right back. Here is one of my lavender plants from last year, before Zoey discovered it as her favorite "spot". Here is the culprit, enjoying a sunny day in the yard. It is fun to look back at my summer garden pictures, all of that pretty green! I have been enjoying the little bit of snow we have had, it is pretty to see the snowflakes falling, we have yet to have anything more than a thin dusting, but it is still very pretty. This morning the snow is mixed with rain, but the kids still got a two hour delay to start school this morning, as many of the students are up at a higher elevation. With Christmas over, both Sarah and Joseph are preparing for Spring events in school- my daughter Sarah is in the concert choir, and they are preparing for Spring performances. My son is in his first high school play- The Giver- and will be playing the Father. Joseph is spending a lot of time memorizing his lines, and enjoying play practice. I love that they have the opportunity to take part in events like this. Here are a couple of YouTube videos of my daughter's concert choir group during last spring's competition. They always sing such beautiful songs, I have heard a few of the songs they are learning this year and can't wait to hear them perform. Both gardening, music and plays remind me of my dear grandma. My grandma is one of the best gardeners around, she even taught her Meals on Wheels delivery volunteer how to grow tomatoes, he now grows a huge supply of tomatoes in many varieties and donates them to people he delivers food to, and he fondly calls my grandma his "tomato guru", which really pleases my grandma. My grandma spent her younger years, back in the 30's and 40's singing and doing plays, she even had her own radio show! Boy would I love to have recordings of that. Along with all of that, she has traveled to Egypt, England, and France- she has such fascinating stories to share. 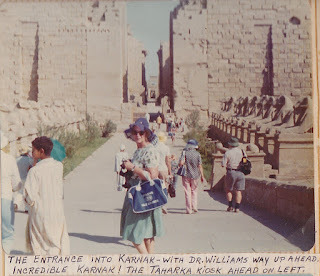 Here is a picture of my Grandma at the entrance to Karnak in Egypt back in the 1970's. So that is what I am up to this week, enjoying the winter weather, and planning my spring garden. I am also looking forward to getting out some of my Groundhog's Day and Valentine Day decorations this week. When do you start planning your garden? Do you have a favorite place to get seeds? Good Morning from Wales! Oh, how I do love this time of year as the seed catalogues plop onto the door mat and the great selection of food and flowers begins again. Thank you for your kind words over on my blog too. I am currently not able to post comments of thanks on my own blog! What a too do! Made out my order to the seed catalogs this week. I like Pinetree Gardens. They seem to have the best prices and lots of fun heirloom varieties. Didn't need to buy many because I save my seeds. Just onions and carrots and some clove pinks seeds. Your grandma sounds like such a fascinating person. Thanks Sarah for entertaining me this morning with her choir. So which catalog on the whole (prices and quality) carries the best seeds? Thanks everyone for all of your comments!